Dognecea (German: Dognatsch, Hungarian: Dognácska) is situated in thick deciduous woodlands where the only compact linden forstest of the Carpathians can be found. Up until World War I, Dognecea was a place of copper and iron ore production. Since this part of the Banat Mountains is rich in minerals, it is an eldorado for collectors from all over the world. For a long time now the mines attracted many geologist and mineralogist. The importance of Dognecea for the Habsburg economy and military at the end of the 18th century is illustrated by the fact that it was declared a “Free Miningtown” in which the mining court was situated. Due to the rich ore sources, the city had a fourishing copper and metal production in the 18th century. 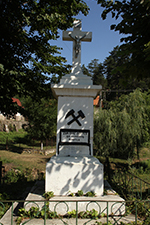 Around the city, metalworking industries developed and the iron was transported to Bocșa, Reșița and Anina to be processed. This continued until the effort became to expensive and the melting of metals was abandoned. Mining was continued however . Governor Count Claudius Florimundus Marcy d’Argenteua, the first Governor of Banat, had already at the beginning of his mandate in Temeswar commanded two dams to be built at the Dognecea-stream. The water was intended to act as a coolant for the iron smelt in “Dognatska”. Today, the “Big Pond” and the “Small Pond” are popular for their water lillies and their richness in fish. As early as the 18th century, several bridges had to be built alongside the course of the river around the city. At the time when the area was mostly populated by Germans, a real “culture of bridges” came into being. 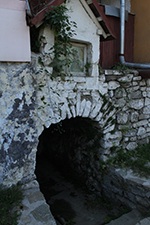 A special object of this region are the wells called “Prindl”. Mostly, they are accessible for the immediate neighbours – and they are always well cared for. They are cleaned several times a year and each is dedicated to a saint. 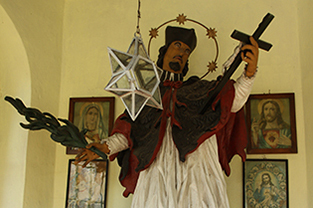 Religion and mining were closely connected in Dognecea since the danger the miners had to face daily resulted in a deep faith in God and patron saints, especially Saint Barbara. Many things in Dognecea are related to religious symbols and the most important religious festival is still connected to the mining industry. One of the most important monuments of Dognecea’s cultural history is Nepomuk’s Chapel at the centre of the village. 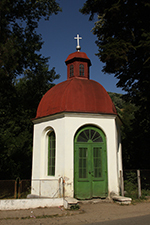 Saint Nepomuka was Banat’s patron saint in the first half of the 18th century and therefore the chapel in Dognecea was dedicated to him. Many reference works also point to the significance of the two “Bergmandln” (a local expression for miners), which flank the saint: they are dressed in the work clothes of a miner and equipped with pickaxe and sledgehammer. LEFT: The den around the well is decorated with images of saints. Many people who’e property has a source have them consecrated several times a year by priests. 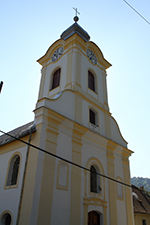 RIGHT: The Roman Catholic church (1733) at the village centre is one of the oldest in the whole of Banat. LEFT: Nepomuk’s Chapel at the centre of the village is one of the most important monuments of Dognecea’s cultural history. RIGHT: 1860 wayside cross as it can be seen at almost all “Pruckn” (bridges) in Dognecea; in good condition and always with a new coat of paint. The cross shows Jesus Christ and the mining symbols pickaxe and sledgehammer.